This orange wagon has an automatic transmission and is powered by a 2.0L H4 16V GDI DOHC engine. Motivated by that frugal motor it gets 8.8 L/100 km in the city and uses just 7.2 L/100 km out on the highway according to Transport Canada. Our Crosstrek's trim level is Limited CVT w/EyeSight Pkg. This Crosstrek Limited is the top trim complete with Subaru's patented EyeSight complete with pre-collision assist, adaptive cruise control, and lane keep assist. This safety package comes on top of an 8 inch touchscreen infotainment system with GPS navigation system, Apple CarPlay, Android Auto, STARLINK smartphone integration (including Aha radio), and a premium sound system. For comfort, this crossover has dual zone automatic climate control, a heated steering wheel, leather seats, a 6 way power driver's seat and a power sunroof. 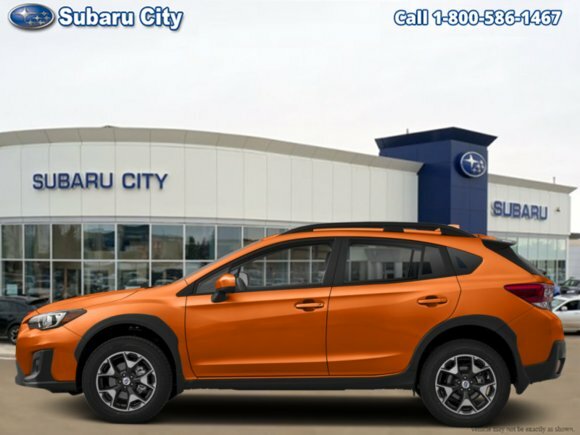 For safety, it packs in steering responsive, automatic LED headlamps, and Subaru Rear/Side Vehicle Detection System (SRVD) with blind spot detection, lane change assist, and rear cross traffic alert. The CVT comes equipped with X Mode for even more rugged off road capability. This vehicle has been upgraded with the following features: Navigation, Leather Seats, Sunroof, Heated Seats, Rear View Camera, Blind Spot Detection, Premium Sound Package. Want to try the 2019 Subaru Crosstrek Limited CVT w/EyeSight Pkg?